Decision: What should you replace Great Concussion with? There was probably a point at which Aggro decks didn't play Great Concussion; after all, it doesn't do damage or improve your attacks. However, with the rise of defensive decks that could score nearly all of their objectives without interacting with the opponent at all, most Aggro decks began to include a few easy to score passive objectives - most notably the powerhouse Alone in the Darkness. Concussion allowed Aggro decks to come out of the gate with extreme aggression, then strategically back off any models that missed their attacks in order to score Alone. Add on to that it's potential to disrupt the opponent's plan in a critical manner, and Concussion became as much as staple in Aggro as in any other deck type. With Concussion gone, and a slew of new passively achievable objectives like Fired Up released, it's unlikely that many aggro decks will continue to play Alone in the Darkness (particularly with 9-model armies lurking). So the core mechanic we will be looking for in a replacement for Concussion will be the ability to lead out aggressively with your models and then pull back in case of catastrophe or push forward to ensure you are able to score aggressive territorial objectives. Perhaps the most obvious analogue to Great Concussion - Earthquake - performs admirably for pushing your models deeper into enemy territory, but is mostly worthless at creating space between your fighters and the enemy's. Two other options more closely mimic the versatility of Concussion for Aggro, though neither one will affect as many models. Since Great Concussion was very much about positioning your own models for Aggro, (ignoring for now Alone in the Darkness) Quick Advance is one good choice for replacement. Advance can't target your leader, and requires her to be on the board, so it's essential that your warband have A) a relatively tough leader and B) at least two support models who are worth pushing - Sorry Gitz and Eyes of the Nine! In all seriousness, this option is probably strongest for Magore's and Dwarves; other warbands have better options. Speaking of those options, our second possible Aggro replacement will serve most decks better than Quick Advance. Centre of Attention provides most of the benefits of Great Concussion, though on a much smaller scale. It can target either player's models as the "anchor" and could potentially target up to 12 additional models (though it could only push 6 of them). It fits well into Aggro in that you can target opponents' models to push your attackers into range or pull them further into your opponent's territory, or you can target your own stragglers to sound a strategic retreat. In some rather specific situations, Centre can even be used to disrupt your opponent's plans by pulling his models off objectives or edge hexes. Finally, it's great for setting up support for warbands that are largely stuck with low accuracy attacks - Yay Gitz and Eyes of the Nine! Hold Objective style decks are definitely the largest beneficiaries of the Great Concussion ban. Unfortunately, we here at Call it Shadespire! (being relative newcomers who picked up the game with Farstriders) don't have a lot to say about their previous deckbuilds because they basically didn't exist competitively in the period after Concussion became popular. While it's possible that Hold Objective might have played Concussion in an attempt to bump models back into place after an opponent disrupted their plans, it certainly isn't a large loss. So how do we replace it in these kinds of decks? More importantly, what can Hold Objective decks do to deal with the possible Concussion replacements that Aggro and Defensive decks will likely latch on to? First, you'll need to play Earthquake. A lot of people will be falling back on Earthquake as a way to disrupt your plans, but it has a weakness that Great Concussion didn't: it's reversible. While following up Great Concussion with a Concussion of your own generally only resulted in shifting 1 or 2 models back into their prior positions, dropping your Earthquake in response to your opponent's will usually result in most or all of the models being returned to their old positions. Because of the rules for initially setting down objectives, it's unlikely that any other popular ploys will move more than one of your models off an objective at once (unless Mischievous Spirits suddenly comes into vogue), so most disruption can be dealt with by playing Sidestep - or grab extra versatility with Inspired Command. However, you do have one other new toy to consider: Irresistible Prize. Like it's cousin, Centre of Attention, Prize allows you to potentially target a ton of models (18!) but at most you'll be moving seven of them. The upside of this one is that it actually allows you to place a model directly on the initially targeted objective, potentially scoring you points in the end phase. The recent bans seem to have hit Defensive decks the hardest, as Great Concussion and Quick Thinker were key elements of their strategy. Additionally, most Defensive decks were probably already playing many of the available replacement options - cards like Sidestep and Distraction. Unfortunately, the go-to replacement - Earthquake - simply doesn't stack up in Defensive, unless you are really worried about Hold Objective decks. 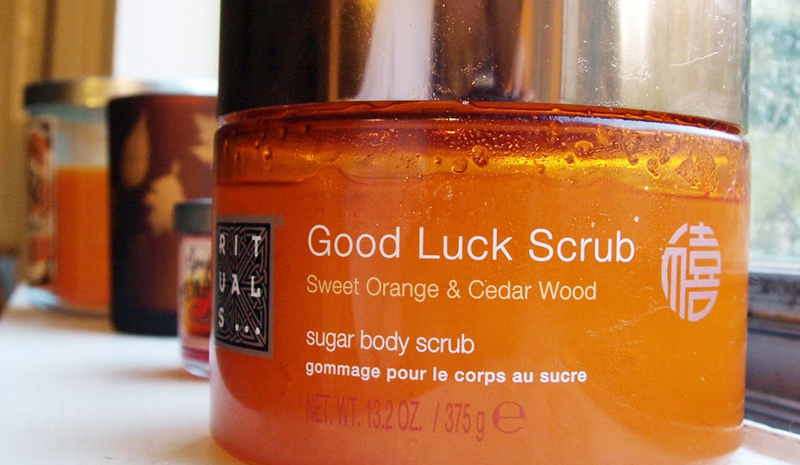 With that in mind, lets look at some options to help make up for the loss, at least in part. In Defensive decks, Concussion served one main purpose - to create space between your models and your opponent's models in order to delay attacks. Nothing does that job like Concussion did, so we'll have to look at new ways to achieve the goal of delaying enemy attacks. As mentioned above, Centre of Attention and Irresistible Prize can be helpful, and they are probably worth considering for inclusion in Defensive decks as well. However, we also have some options that are more specifically tailored to defensive play. Mirror Move may not seem like an intuitive choice at first, but it provides some much needed flexibility while effectively negating an opponent's ploy. While you certainly risk Mirror Move ending up dead in your hand, it's worth noting that very few decks are going to be able to effectively hunt down your models without some kind of push action. In the early game, you can use it to back up your front-rank models as your opponent approaches. Once your opponent comes into striking range, Mirror Move can be used to set up counterattacks, provide support, or further shimmy away from threats. Dancing with Death fills a similar role to Mirror Move, though it plays off a significantly more dangerous trigger. That said, your opponent is going to miss at least a couple of attacks as long as you've chosen your warband wisely. Being able to push the missed model two hexes all but guarantees that the enemy won't be able to follow up with any more attacks on that that model during that round. Finally, we should look at one of the more unorthodox options available to Defensive decks. Baffling Illusion probably needs some clarification from the FAQ team, but as written it appears to provide a significant advantage to the defensive player - it shuts off your opponent's ability to charge for a turn. Since charging requires you to end a move action in range of a legal target for your attack, and Illusion prevents moves, charging isn't even an option that your opponent can select that turn. As a bonus, Illusion can also effectively create space through the scatter mechanic. Unless your opponent rolls 3 axes on their scatter dice (a 3.7% chance), their model is likely going to have to eat at least one hex of useless detouring. When we throw in blocked hexes and edges, Illusion becomes even better at disrupting your opponent's plans. Hybrid decks probably lose the most from losing Great Concussion. Not simply insurance against aggressive decks or a key strategic component, Aggro-Control Hybrids saw Great Concussion as the ultimate in versatility. Depending on what was needed at the moment, it could create space, set up attacks, disrupt enemy strategies, enable key objectives, or any combination of the four. The following cards, while varied in use and strength, all warrant consideration as replacements for Great Concussion in that they perform at least one of the functions that it did for one deck type or another. We're not specifically advocating for any of them like we did for the universal options, but they're definitely worth a look. In all seriousness, there's no replacement for Great Concussion. Swing for the fences with something new. 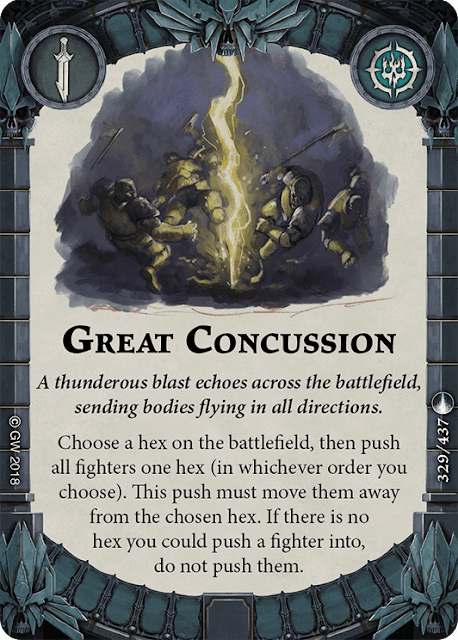 Depending on your playstyle and warband, you likely have several options for suitable replacements for Great Concussion. Prior to its banning, it was probably the most powerful card in the game, so you're not going to find any card that fills its role completely. Earthquake becomes a much stronger option with the banning, as do similar multi-target utility cards from Nightvault like Centre of Attention and Irresistible Prize. Depending on how you feel about the options available to you, it may be better to not seek a replacement specifically for Great Concussion, and instead simply fill its slot with a card that provides a different kind of utility. In the end, it's impossible to predict exactly what effect the bannings/restrictions will have on the meta, so pick a strong replacement card and see how it performs for you.